You cannot harvest wood products from JBER unless you have contacted Charlene Johnson and received an approval validation. Effective 1 November, the cost for a cord of personal use firewood on JBER will be $35.00 and $17.50 for up to one-half cord of personal use firewood. All recreators wishing to obtain a personal use woodcutting permit must first obtain an iSportsman recreation permit. Once that permit is obtained, the recreational permit holder can contact the JBER Forester at charlene.johnson.3@us.af.mil for initial authorization. Once notified (via email), a permit holder can go back to iSportsman to purchase their woodcutting permit(s). No firewood collection is authorized without a valid permit. Authorization to purchase a woodcutting permit is not authorization to harvest firewood. Woodcutters are strongly encouraged to sign into iSportsman as a recreator and inspect available resources at authorized woodcutting areas prior to purchasing their woodcutting permit. Only authorized woodcutting areas will be available for harvesting firewood. Permitted woodcutters are responsible for ensuring that the desired forest product quantity and type are available prior to purchasing a permit. No refunds for woodcutting permits will be issued. Woodcutting or harvest of other wood or forest products on JBER is authorized for personal use only (673 ABWI-32-7001 Section 5.8) by the authorized and permitted woodcutter. Personal use products harvested on JBER may not be sold, bartered or traded. Personal use firewood permit holders cannot receive any compensation for wood products given or donated to others. Free Personal Use Firewood Permits will not be issued after COB 26 October 2018. All free permits will expire no later than 31 October 2018. To get authorization to purchase a firewood cutting permit contact Charlene Johnson by email at charlene.johnson.3@us.af.mil and provide your full name, iSportsman permit number, and email address. You will be contacted with more information and instructions. Requests can only be processed Monday - Friday, 9am - 3pm. Please allow 1-2 business days. - Firewood obtained from JBER may not be resold or bartered. Prosecution may be pursued. You must Sign-In/Sign-Out for woodcutting, just like any other recreational activity on base. NOTE – When attempting to Sign-In, you will only be allowed to Sign-In to training areas that are currently open; if you don’t see your preferred training area, it is NOT available. Upon Signing-Out from ISportsman, you must indicate how much firewood you collected that day. Woodcutting may take place only in designated areas marked by woodcutting signs. Be aware that specific areas (as designated on the maps) only allow for the collection of downed trees while others allow you to take dead standing spruce trees and anything that is already downed. It is your responsibility to pay attention to the maps/instructions. Woodcutting area access is subject to military training activities, which can, at times, significantly limit access to Richardson Training Areas. Unfilled permits will not be extended except in extreme situations when prolonged closures due to training impedes reasonable access to authorized woodcutting areas. Each woodcutting permit will be valid for up to 30 days (or until the end of the calendar year, whichever comes first). The availability, including quantity and quality, of firewood authorized for harvest with a woodcutting permit is determined based on forest resource management objectives and is not guaranteed. The person whose name appears on the permit must be present at the cutting site. Wood cutting permits are non-transferable. Additional persons assisting you with wood cutting must also be registered with a valid iSportsman Recreation Permit and be signed in on the iSportsman system. DO NOT fall any standing trees with nest boxes, signs, or other property attached to them. Also, be cognizant of snags (dead trees) that are being used by birds or mammals. Snags are commonly used by a variety of species for homes so check for bird or mammal use before salvaging. Do not fall, drag, or cut trees into the roadway, leave limbs or log sections lying in vehicle access routes, or otherwise block traffic at any time. Drag unwanted material and debris off the shoulder of the road. Precautions must be taken to prevent spills of gasoline and oil. Litter must be removed from the site. DO NOT fall trees within 30 yards (90ft) of any power lines. DO NOT leave any portion of a tree suspended or hanging. Be certain that all portions of trees felled are on the ground when you leave. Stay only within 100 yards (300ft) of authorized roadside cutting areas. No vehicles, to include off-road vehicles, may be taken off of maintained roadways or past metal gates (open or closed). DO NOT disturb anything that resembles unexploded ordnance. If you did not drop it, don’t pick it up. If you think you have found unexploded ordinance mark the location, take a photo, leave the area, and report your findings to the Range Control Fire Desk at 907-384-6230. Failure to follow these instructions may lead to loss of wood cutting privileges on JBER. Spruce Bark Beetles Are Active on JBER! Learn more about Spruce Bark Beetles! SBB is in the JBER News!! The official measurement of firewood is a “cord.” A full cord measures 4 feet high by 4 feet wide by 8 feet long (4’ X 4’ X 8’) and has a volume of 128 cubic feet. 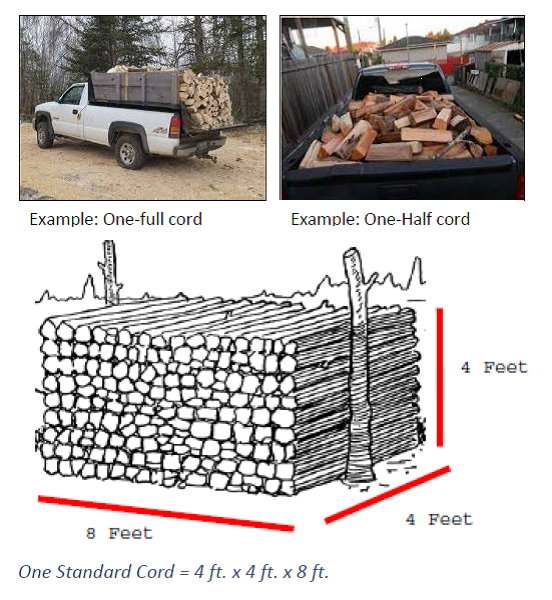 To help you make an accurate estimate, here is how some common units of firewood measurement compare to a full cord. One full-size pick-up truck load (standard sidewalls on an 8 foot box) equals one-half cord, whether the wood is stacked carefully so it is about level with the truck box sides, or is thrown into the truck box with the top of the pile about as high as the cab. Two full-size pick-up truck loads is the approximate equivalent of one FULL cord. Rail extensions may allow for a full cord to fit into one truck load.